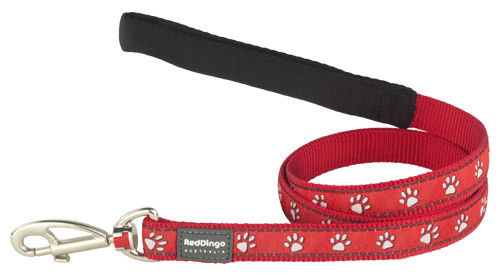 Dog collar by Red Dingo in Desert Paws Red design. Made with premium high density nylon webbing and solid stainless steel D-rings. The collars are adjustable, making them ideal for growing pups and all dogs. They are extremely hard wearing and feature the unique 'Bucklebone' in acetal plastic which provides quick release and easy fitting and really adds that designer detail. Good quality dog collar with stunning design. Our black lab looks very handsome wearing it along with new dog tag. Would certainly purchase similar goods in the future. This is a wonderful collar and looks great on my Cockerpoo. I would highly recommend and would definately buy another one. Me and my dog love this! Awwwww my dog looks really smart in his new dog collar! 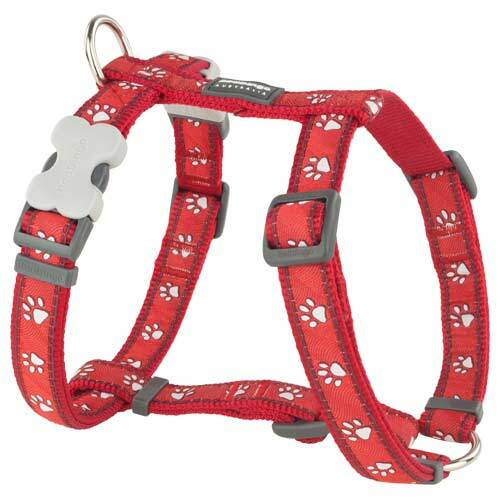 Really well made, very comfy round his neck with cute paw prints and a cool bone shaped click and release fastener. Excellent product and a good price too. Excellent quality collar. Looks great on white dog. Very happy with this product.